Je ne sors avec personne. My sister doesn't like anyone. Just as the construction ne… pas is used to negate a sentence, use ne.. personne to express 'no one / not anyone'. Personne on its own means ''no one'', but une personne means ''a person''! Qui est là? - Personne. What is the difference between n’importe qui and personne? The nuance here is of meaning, but it is indeed quite tricky as in English, you could translate either with "anyone". However, personne means the absence of a person, i.e. noone/not anyone, hence it being used with the negative ne. N'importe qui means a non-specific person, but definitely someone, i.e. anyone, and therefore will not be used with ne. Personne ne peut le faire. How is aucune used? Can this also mean « no one »? Hi - in the Kwik kwiz one of the answers includes the construction Il n'y a personne. Why is it Il n'y a personne and not Il y n'a personne? The lesson doesn't explain it. Thank you. Hi Michael, French has a very strict word order. 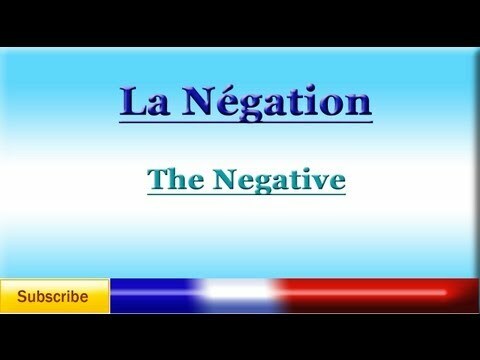 In a negation, you will always find this order: 1) Start the negation with "ne" 2) Then come: me, te, se, nous, vous (reflexive pronouns) 3) Followed by: le, la, les (direct object pronouns) 4) Followed by: lui, leur (indirect object pronouns, 3rd person) 5) The pronoun "y" 6) The pronouns "en" 7) The verb to be negated 8) And finally the other half of the negation: pas, rien, personne, plus, etc. Example: Il n'y a personne : Il = subject n' (ne) = start of negation y = pronoun a = verb personne = the concluding part of the negation. That is the standard order. Normally, not all elements in the list above actually occur in one sentence, so you just skip them. The order remains nonetheless the same. -- Chris (not a native speaker).